Recently I had the opportunity to review the Boston Tea company. Yes, this is the same company that experienced the tea fiasco in 1773! So if the company is still around after all those years you’ve certainly got to know that this is a good company with superior products. 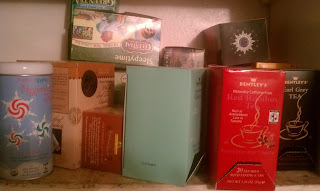 I love tea, and to show you just how crazy I am for it here is a picture of my tea cabinet! You can’t see it very well but they are double stacked, and the cabinet is deep. So when I was offered the opportunity to review Boston Tea I was overjoyed. What I didn’t realize was Boston Tea’s products do not taste the same as the other brands I’ve tried. I was under the impression that once you’ve tasted tea you’ve tasted it all. I was wrong. Man was I wrong. So Boston Tea’s tea is different. When you brew it you can taste the difference. It’s fresher for one thing, but there is no bitter taste. I’ve experienced the bitter taste in a lot of brands and certain teas I do not buy because of it. 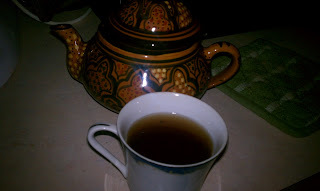 For example, black tea usually has a strong bitterness to it so you need a lot more sweetener. With Boston Tea’s black tea I did not find any bitterness at all. I hardly used sweetener. You don’t need as much sweetener in your cup. They also have some specialty teas that I’ve never heard of before. I reviewed white tea, green tea, black tea, and red tea. I had never before had red tea and I have to say it’s my absolute favorite. I’m forever a red tea gal. I also reviewed a tea called Red Rooibos in the Pomegranate Cherry; this is the red tea I was referring to that I loved so much. Oh my, it’s really yummy. The picture above is red tea rooibos, my absolute favorite. There is a certain way you are supposed to steep tea. I had been doing it wrong for years until I read the paperwork the company sent me. You boil fresh water, open a fresh tea bag, place into the cup, and then pour the hot water over the tea bag. You wait up to 3 minutes for it to fully steep and then take the tea bag out, sweeten, and drink. Another thing I did not know is that not all teas are created equal in the caffeine world. In fact, some of the tea I received does not contain caffeine at all. According to Boston Tea, there’s approximately 45 mg of caffeine in black tea, 20 mg in green, and 15 mg in white. Rooibos, red, or herbal teas do not contain caffeine. Boston Tea offers loose and bagged tea. >this would be nice for my boyfriend, i just went to make him a cup of tea last night and realized we were all out of his earl grey so he had to have my chamomile tea this would make for a nice gift for him 😉 thanks for the giveaway! the chocolate mint decaf sounds great!! >i love camomile and pepermint tea. with some sugar and milk. I love tea, and live right outside of Boston, so I need to try this -thanks for the review!